The ArtRage Motor Sports Series Number 10. Here we have the tenth in the series. The 1955 Mercedes Benz W196 Monoposto Formula One Car. I’m stopping the series at the end of December so I’ll probably only get two more completed before then. I have an Alfa in the works, and the infamous 1975 Brabham Martini Formula 1 car. 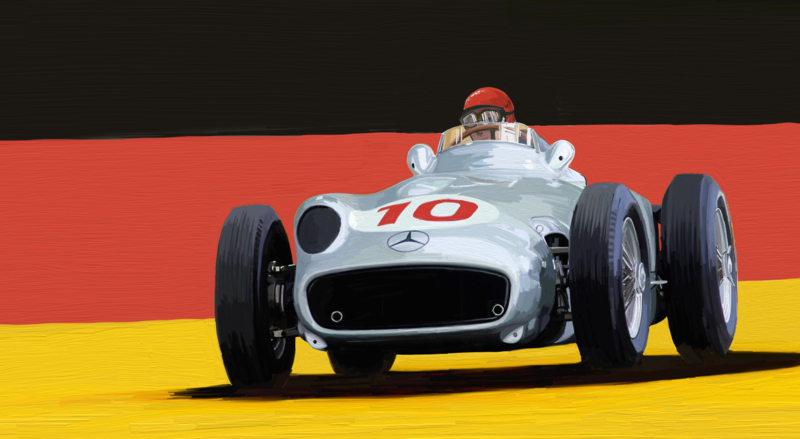 Posted in Design and Art, Postaday 2011 and tagged 1955 Mercedes Benz W196 Monoposto, Artrage, Auto Racing, iOS, iPad Applications, Mercedes-Benz, Vintage Motor Sports on December 21, 2011 by Author.